Note from Robb: A friend of mine, Mike Davenport, shot me an email the other day asking to write up a guest post for robbsutton.com to help promote his leadership survey for an upcoming launch. Like any good friend…I said “Sure! Send it over!” So here is Mike’s guest post for robbsutton.com and you can find his survey link at the bottom of the post. Take a quick second out of your day to take a look. It will only take a minute to fill out (you are not signing up for anything if you don’t want to). I took off this weekend and blasted up to NYC to visit family and see some sites. 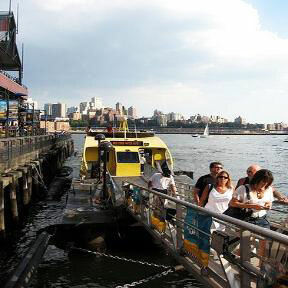 Part of what we did was to take the kids to Manhattan by Water Taxi. It wasn’t my first time on the Taxis, but by far my longest trips. After about an hour touring around a few lessons leaped out, ones that I know can help me with my online biz. Lesson 1: Be prepared, cause you never know . 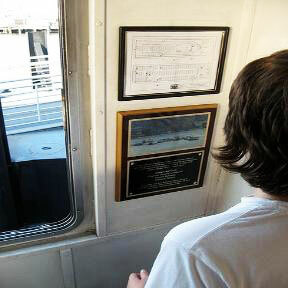 . .
Sure enough, the Taxi we were on was the first boat to respond to USAir Flight 1549 that had to ditch in the Hudson. I asked one of the dock hands and he told us about the crash, and how they were right there. The ins and outs. He told us that they were ready for such events, had plenty of gear, and although it wasn’t part of the normal day by any means they were ready. Crazy, ready for a plane ditching in front of you! But someone had thought that through. Lesson 2: Perform a valuable service. This photo shows not only folks getting off the Taxi but folks glad that the Taxi got them were they wanted to go, for a decent price, and did it well. What isn’t shown is the huge line of folks behind me waiting to get on. And they were not all tourists like me. I bet a bunch were locals who relied on the Taxi’s service for their daily routine. My learning: give more than people pay for, and do it well, and they will line up for you. Lesson 3: There will be businesses a lot bigger than me, so find a good niche. 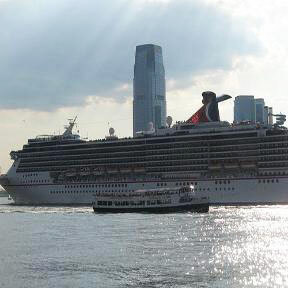 The cruise liner behind the Water Taxi in the photo is fully loaded with tourists traveling probably to the Caribbean. The Taxi is traveling about 1/2 mile up the river. The liners have their business, the Taxis have theirs. Both move people, both have a niche. My learning . . . find a dang good niche, ace what the customer needs, and provide it well. Mike Davenport is an educator focusing on helping emerging leaders thrive in today’s wild work place. Take a snap interview and sign up for a free mini report to learn how to quickly improving your leadership skills. I really like the cruise ship versus the water taxi metaphor. It just shows that a post can come from anywhere, even on a water taxi. I have found that I am especially aware of my surroundings now that I blog. Looking at all times for topics that could be of interest to a blog reader. Bob…I do the same thing. That is why my notepad on my iPhone has become invaluable to my blogging. I can’t stand it when I have great ideas when I am out and about and then can’t remember them later! an iPhone is my next purchase.